Marian McPartland On Piano Jazz, Part One, With Guest Host Elvis Costello The tables are turned, as McPartland sits at the guest bench to discuss her life as a performer and as the host of Piano Jazz. She reminisces about moments from the program's early days; then, guest host Elvis Costello sings as McPartland plays "Our Love Is Here to Stay." This week's installment of Piano Jazz marks a true milestone, as host Marian McPartland appears as a guest on the program with guest host Elvis Costello. In part one of this all-new interview, McPartland and Costello recount some memorable moments from the program's 30-year (and counting!) run. The session opens with a mainstay of Piano Jazz: the duet. In a fitting tribute to the program's 30th anniversary, Costello serenades McPartland as she plays "Our Love Is Here to Stay." Afterwards, McPartland adds, "That was a treat! I seldom get a chance to accompany you." Turning toward the subject of guests on the program, McPartland and Costello discuss the very first guest on Piano Jazz: Mary Lou Williams. "I picked the wrong guest," McPartland says. "I adored her playing, but she was very tough." Williams displays some apprehension in the interview clip played here. But Costello looks on the bright side. "At the end, you had really won her over — she audibly relaxes," he says. "You actually did cajole her to vocalize, although she was not known as a singer." Pianist Bill Evans also appeared on that first season, and gave an in-depth demonstration of rhythmic displacement in Cole Porter's "All of You." Throughout the program's history, McPartland has interviewed many great players at length on the topic of technique. For musicians, it's an invaluable aspect of the program. "It's extraordinary to hear someone of Bill Evans' level discuss the mechanics which go into the magic that we hear," Costello says. Next, McPartland and Costello discuss the opportunity to bring singers on to the program. When McPartland's friend Rosemary Clooney, appeared, she addressed the challenges of raising a family and maintaining her career. "When I first started, I had five children in five years, and my work always involved a lot of travel," Clooney said. "Now, they're all grown, and I can really concentrate." Clooney sang the Cole Porter tune "Don't Fence Me In" with accompaniment by McPartland, who added, "I just think you're better than ever." Costello notes McPartland's attraction to lyrics. "You frequently comment on the story of the song, and particularly the melancholic romanticism," Costello says before singing another McPartland favorite, Rodgers and Hart's "Dancing on the Ceiling," with pianist Pete Malinverni. The first installment of this interview ends with clips of two other regular Piano Jazz features: McPartland's on-the-spot musical portraits of her guests and improvisational invitations to them. McPartland describes her first-ever portrait, created for pianist Chick Corea (hear that full show here). "I'll tell you the ingredients: A lot of strength, humor, energy, a lot of creativity, love, kindness," McPartland says. "I'm not going to have time for all of this!" Finally, Teddy Wilson plays a brief sequence of five notes, which McPartland uses to improvise a heartfelt tune. "Listening to your portraits and your five-note compositions reminds me of when people speak about 'soul' in relation to music," Costello says. "It seems to me quite possible that everyone we have ever known or loved through music is with us in the chance turn of a phrase or a signature rhythm. I think you certainly have captured many of the ingenious personalities in this series so that they will be forever enduring." Tune in next week for part two of this special session, featuring performances by Marian McPartland with husband Jimmy McPartland, Dizzy Gillespie and more. This program will also feature guest host Costello as he unveils a new tune, "You Hung the Moon." Originally broadcast Jan. 5, 2010. 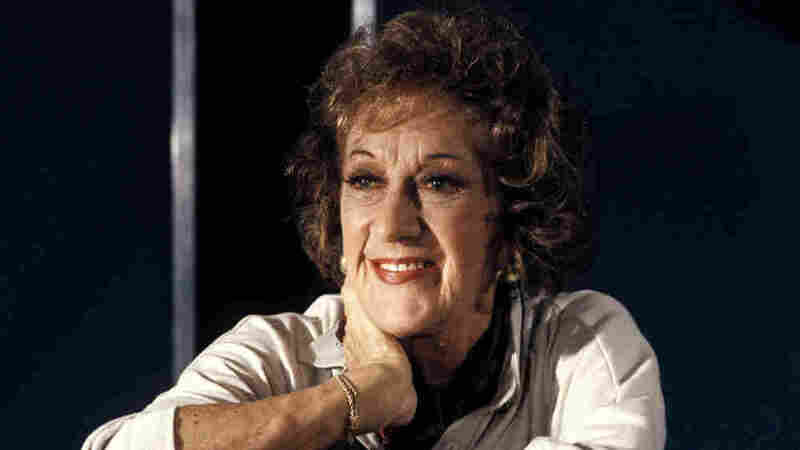 Marian McPartland passed away in 2013.